Wild raccoons are capable of destroying a property from the inside and the outside; and it only takes a matter of weeks for the damage to intensify into a costly situation. For this reason, raccoon control is necessary for those who live near areas with high raccoon activity, such as homes near woods or forests, city centers, or bodies of water. Although they are intelligent and interesting critters, their bad behaviors can cost property owners money in terms of restorations, cleanups, and repairs. Raccoons are known to find entry points into homes and onto properties by using their dexterous paws. They can open doors and gates, pry open roof shingles, lift hatches, and much more. 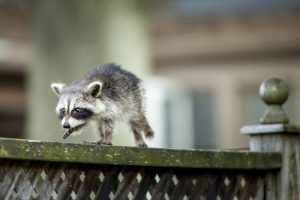 This is another reason why correct raccoon-proofing and prevention is important to property protection. Various issues and dangers can also arise from raccoon activity. They pose several problems for homeowners, costing them money for restorations, repairs, and more. Raccoons are commonly found in attics, crawl spaces, under porches and decks, garages, sheds, and even electrical boxes. Once they gain entry into a house or building, bad behaviors and resulting damages begin immediately. For instance, areas like dry wall, insulation, and ceilings are destroyed right away, just for the sake of gaining entry inside. Aside from immediate damage, raccoon urine and droppings will begin to accumulate in large amounts. This kind of raccoon damage is hazardous, so it requires professional sanitation and cleaning services. Raccoons typically search for shelter to protect themselves from outdoor elements and predators, and for breeding. To makes nests, they will rip down attic and wall insulation, which can be frustrating for homeowners since insulation can be costly to replace and requires a professional service. These common raccoon behaviors are all detrimental to a property, from the inside out, as well as your bank account. Once raccoons begin to breed, each female is capable of birthing multiple raccoon pups. This means that colonies can quickly multiply if they are not caught and extracted early on. This is bad for many reasons. The more raccoons present in or around a property, the more extensive the damages will be. It is highly recommended to hire a licensed Indianapolis raccoon control company for expert advice and service. It can be dangerous attempting raccoon removal without proper training, knowledge, and tools. Trust a professional in the industry for reliable, safe, and effective services. 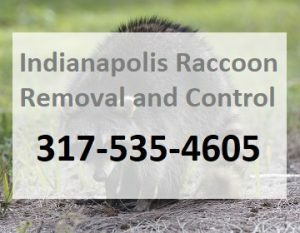 Call 317-535-4605 for professional raccoon removal and control in Indianapolis, Indiana and its surrounding counties. We are DNR licensed and insured wildlife control specialists that offer a wide range of affordable animal removal services for commercial and residential properties. Call 317-535-4605 to request a free estimate for Indianapolis raccoon control, today. This entry was posted in Raccoon Cleanup, Raccoon Removal and tagged 24 hour raccoon removal, Indianapolis raccoon control company, raccoon cleanup Indianapolis, raccoon damages, raccoon removal tips. Bookmark the permalink.